SealMaster Top Fuel Dragster will Debut in Norwalk, Ohio, with Kalitta Motorsports’ J.R. Todd Behind the Wheel. MAD Creative Concepts puts the finishing touches on the SealMaster Top Fuel Dragster, which will make its debut this weekend at the Summit Motorsports Nationals, with J.R. Todd behind the wheel. 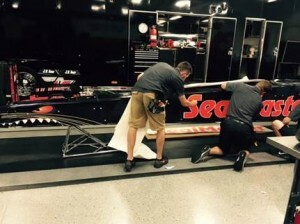 SealMaster will expand its role to the primary level on J.R. Todd’s Top Fuel dragster at upcoming NHRA Mello Yello Drag Racing Series events in Norwalk and Denver. SealMaster has been a valued Kalitta Motorsports partner since 2014, but this is SealMaster’s first primary sponsorship at the Pro level of the NHRA Mello Yello Drag Racing Series. Based less than an hour from Summit Racing Equipment Motorsports Park in Sandusky, Ohio, the franchisor distributes SealMaster pavement maintenance products and equipment through franchises coast to coast. The company’s products and equipment are sold in every state where the NHRA Mello Yello Series races, and SealMaster franchisees and customers have enjoyed Kalitta Motorsports’ hospitality and winning tradition for two seasons. The black scheme makes its debut at the home race for the SealMaster brand before taking on the altitude in Denver, where Todd walked away with the victory last season. The Mopar Mile-High NHRA Nationals has been a great place for Todd throughout his NHRA career. He earned his first victory in Denver in 2006, which was part of his historic run to the Auto Club Road to the Future Award. Fans will have the opportunity to meet Todd as he walks with fans prior to the race action during the SealMaster NHRA Track Walk. SealMaster, an NHRA partner, backs the Track Walk at all 24 NHRA Mello Yello events. Fans can also meet Todd, along with teammate Doug Kalitta, at the SealMaster display in Norwalk as the SealMonster display dragster makes its return to the NHRA Nitro Alley.